They don't look specifically like truck windows to me. Maybe you're interpreting the shapes that way because we know he eventually gains his truck alt mode. April Fools Day sure was fun, wasn't it? joevill wrote: Way to go Jon!!! Actually they DIDN’T! They mailed out limited edition VHS tapes of the movie to the press! I got one!! Great work Jon! Also great work in Bumblebee! Your Shockwave and Soundwave were spot on! My friends really thought that was Corey Burton and Frank Welker! I said “no! That’s the guy who does the voice in Homest Trailers and he actually played Optimus Prime in a cartoon!” It blew their mind. 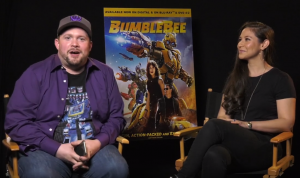 As you know, Seibertron's very own Jon Bailey voiced both Shockwave and Soundwave in the Bumblebee movie. And now, for the How it Should Have Ended youtube video for Bumblebee, Jon gets to voice every other Transformer (except for Bumblebee). So you can hear him as Soundwave and Shockwave again along with ratchet and of course Optimus Prime, who he previously voiced in Combiner Wars (as well as the prep voice in the Bumblebee film). Pretty cool to see that it's all the same person voicing all those bots. Paramount has approved of this youtube video as well, which is always an added bonus for fanwork. We hope you enjoy it, it's a pretty funny video, especially all the Optimus bits. 5,605 pages were recently viewed by 947 unique visitors. This page was viewed 1 times on Saturday, April 20th 2019 9:36am CDT. © 2019 Seibertron, Inc. DBA Seibertron.com. All Rights Reserved. Established June 2000. Seibertron.com is owned by Ryan Yzquierdo.